“The thinking man’s blockbuster” is almost an oxymoron these days. 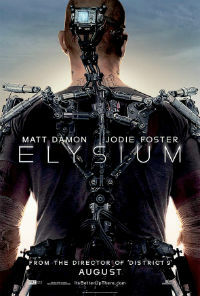 There’s a few exceptions, like the The Matrix or Inception… but unfortunately Elysium is not one of them. Neill Blomkamp has tried to tailor this to the Michael Bay generation, but as a result he’s shunned all the people who loved District 9. He’s effectively made something that’s too smart to be a guilty pleasure for action fans and too stupid for people who enjoy mind-altering sci-fi. Action sequences are sparse and dizzying, the concept is rushed and brushed over, and the cast are too serious to be taken seriously. In other words: Elysium is a mess. Matt Damon is more stale and emotionless than he’s ever been. From watching the trailer you might think this was the intention (he looks half-robot), but he’s actually 100% human so there are no excuses. His heart’s just not in it. Jodie Foster usually nails this type of alpha-female role, but her character’s unclear motives and brash actions make her more of a plot-mover than anything. Sharlto Coply enjoys himself as the savage villain, but because he plays up the accent this time it’s actually more annoying than endearing. The only real emotion comes from Alice Braga, who seems like the only one who wanted to be in the film. Her character is one of the few that audiences can empathise with. For such an original idea, Elysium feels like it’s been done before. It echoes the likes of The Matrix and Gladiator, with a hero destined to free his people and all the character arcs and clichés to match.